Speaking of Women's Rights: Get it together, Olympic commentators. Katie Ledecky beat the world record and won the gold and was celebrating in the pool before her competitors even touched the wall. That phenomenal performance was placed beneath—in both newspaper layout and newsworthiness—the silver medal performance of Phelps. The caption spoke to the rampant sexism at the 2016 Olympics, where fans and viewers are repeatedly left dumbfounded by media and commentator coverage. But also to the way that women’s accomplishments are viewed in the world of sports more generally. According to the UK’s Cambridge University Press, male athletes are three times more likely than female athletes to be mentioned in the context of sports, while women are routinely described with regards to their appearance, marital status, and age. During Ledecky’s performance mentioned in the headline above, she was referred to as a “female Michael Phelps” and was said to “swim like a guy” by fellow USA teammate Ryan Lochte. The United States has swept up 78 medals so far in Rio. Two of the top three medalists are women: gymnastics star Simone Biles and swimming phenome Katie Ledecky. Yet despite dominating performance after performance, the female athletes have faced blatant sexism in media comments, headlines, and social media commentary. Of course, the athletes themselves aren't the only ones affected by this gross display of misogyny. Of the millions of people who watch the Olympics, many are undoubtedly young girls who aspire to be like Simone Manual, the first African American woman to win an individual gold medal in women’s swimming; or like Katie Ledecky, who appears to be superhuman in the water with her record breaking speed; or like any member of the Final Five, a group that is more diverse and more dominant than any other gymnastics team. Focusing on athletes' appearance or marital status over their accomplishments is unnecessary at best and, at worst, damaging to young girls' perception of their ability to become an Olympic athlete. 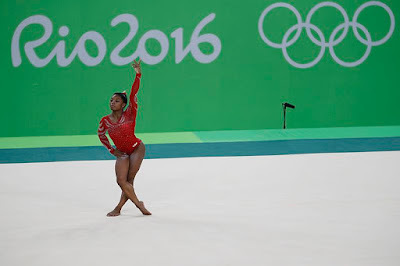 The Olympics do not exist in a vacuum. Women’s sports, and women’s accomplishments in general, are much more likely to be belittled or filed under those of a man. In 2016, there is more pushback than ever, but the fact that these instances still occur with shocking regularity is appalling. Women don’t compete “like a man” when they do well. They perform like the strong, disciplined, talented world class athletes that they are. No comparison necessary.